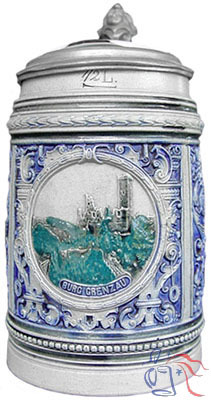 Stoneware, 0.5L, pewter lid (shown with porcelain inlay). Henry I of Isenburg-Grenzau began construction of Grenzau Castle (Burg Grenzau) around 1213 along the Leipzig-Flanders trade route in what is now the town of Höhr-Grenzhausen in the upper Westerwald. Best known for its unusual triangular keep, a unique feature among surviving castles in Germany, Burg Grenzau has become a must-see area tourist attraction. 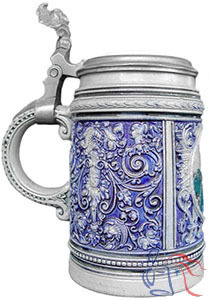 Same model number applied to a Jug with Coats-of-Arms.